* Joao Silva in Sadr City for the New York Times. Silva is always in the middle of things. Here is his own website. * Also in the the Times, the Cat Lady of Switzerland, a textbook example of doing photojournalism with small strobes ala Mr. Strobist. 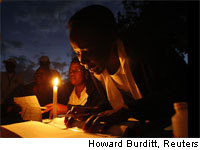 * This Washington Post gallery of the election in Zimbabwe (10 sec. ad). No. 8 in the gallery is show in this post. * Correy Perrine of the Nashuah (N.H.) Telegraph shows you can make an extraordinary photograph at an ordinary event such as a teachers’ protest. *Another good use of small strobes on assignment, an author in a jail cell by Ken Ritchie of the Madison Courier. This entry was posted in Grab Shots, Photojournalism and tagged Newspapers, photography. strobes, Photojournalism, Strobist.